Not everyone will leave a positive comment about your business, according to this social media for business tips on customer review on why you should pay attention to it. What should you do when you see a negative social media consumer review? 1. Be present. What’s the point of creating social media accounts if you are not there regularly? The image below is an example of a company’s slow response to a review, and inquiry. 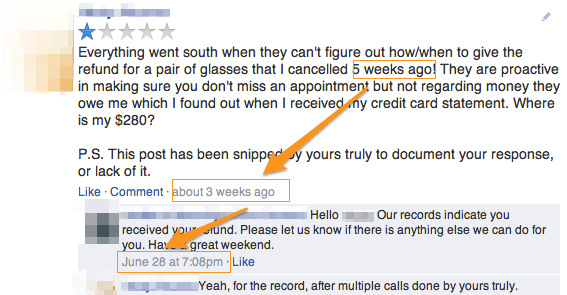 Here is an example of a review that a service provider failed to respond to on time. 3. Respond quickly. Don’t let your customer wait for days. According to a survey by Loudhouse, “52% [of customers]expect to get resolution within a day via social media, and 75% expect [a] resolution within a day via email.” It wouldn’t be difficult to imagine what it’s like to be a consumer experiencing this because we are all “customers,” right? Customer service response to a complaint. How slow is slow? If you are a small business and if you need someone to monitor your social media accounts, there are many companies that social media services for businesses (*cough* ours included). 4. Do not remove the negative consumer review. Deleting it will send a negative message to your customer. Also, stay in that thread of conversation. On Facebook, ‘reply’ to the post. On Twitter, I’d recommend that you save it as favorite so it doesn’t get lost in the sea of tweets. The other reason why you should not delete a complaint is that some customers take screenshots of what they post. I have seen it done by others. In fact, I do that too. 5. Offer a quick resolution. Don’t let customers jump through several hoops before they find help from your company. Knowledge about your product and service is good but a quick resolution to a complaint is supreme to a dissatisfied customer. 6. Take the extra mile. Offer to call the customer instead of telling them to call you, or email you. I just had this experience recently when I had to make a total of 4 calls and emails only to be told that I have to email their tech support so they can prepare an RMA. It turned out that the person doing the RMA is the same person processing it for me. 7. Blog it. What improvements have you made since receiving that negative review? There’s your content! Tell us your story. There are many businesses out there that can learn from your experience. Experience is a better teacher. You cannot please everyone. Do your best to help the customer. Don’t let the negative customer review ruin your day and discourage you. What is your story? Would love to hear from you!